Mangaluru, May 18, 2015: With the best PU result rate in 11 years Dakshina Kannada district again stood first in PU board exam results in the State, with a pass percentage of 93.09. Out of 31,396 fresh candidates who appeared, 29,226 students successfully cleared the exam. The district has secured first position in the State for second consecutive time. The district had secured 90.57 per cent results in PU board exams last year. Total students in DK, 34,717 students, i.e 16,975 boys and 17,742 girls appeared for the exam. Among these, 30,593, 14,300 boys and 16,293 girls have passed, counting overall pass percentage of 88.12 pc. The district had achieved overall 86.04 percentage results during March 2014. In Arts, 5,731 fresh students appeared for the exam, of whom 5,153 have passed, the percentage being 89.91. In Commerce, 13,760 students appeared for the exam, out of which 12,910 have passed and the pass percentage is 93.82. In Science,11,905 students appeared of whom 11,163 students passed out and the pass percentage is 93.77. Students from 181 colleges in DK district had appeared for the exams, among which 53 are government, one Morarjee Desai college, 43 aided and 84 unaided colleges. The numero Uno: Rashmitha, is the daughter of B Purushottam, an entrepreneur and B Shashikala, homemaker, based in Bejai in Mangaluru is the state topper in Commerce. She scored 593 marks out of 600 (98.83 pc), said she aspires to be Charted Accountant and is planning to get into a prestigious college to pursue an integrated course in Commerce, where she can have her B Com and CA courses go simultaneously. She has scored 100 marks in Business Studies, Accountancy, Statistics and Basic Maths each, while 94 and 99 marks in English and Sanskrit respectively. Science stream topper Neehar K Ajith, student of Science at Canara PU College, Mangaluru, scored 589 out of 600 (98 per cent). He scored 100 in Chemistry, 99 in Physics and Maths each and 98 in Electronics. He has secured 99 and 94 marks in Sanskrit and English respectively. He said he aspires to be an engineer. He has written JEE (mains) and CET. He is preparing for BITSAT and JEE (Advanced). He had also obtained coaching from CFAL. Neehar belongs to Kodikal in Mangaluru. His father Ajith is Head of Electronics and Communication Department in Nitte ITI and his mother Pratibha is an employee of Canara Bank. Other than studying, Neehar is interested in reading novels and solving puzzles. 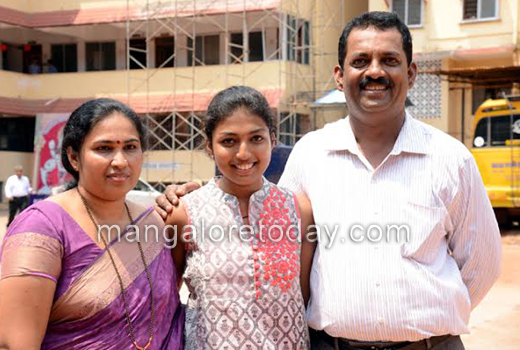 Tarunya Rao S from Canara PU college too has scored 583 out of 600 (97.16 pc). Twin top scores: Anu Sankamar and Bhava Sankamar, twin sisters have scored distinction with 570 and 580 marks each in Science in PU board exams. They are the daughters of St Aloysius College, Mangaluru, lecturer Dr Ganesh Amin Sankamar and lecturer Jayanthi Sankamar. Anu and Bhava are students of Govindadas PU College. Udupi: Udupi District, with 92.32 per cent results, secured second place in the State, in PU board examinations. Compared to last year, there has been considerable improvement in the results. In 2014 too, the district stood at the second position, with 85 percentage. A total of 13,778 students appeared for the examination this time. District PU Education Board Deputy Director in-charge R B Naik said all efforts were made to improve the district to the first position in the State. Teachers were directed to pay individual attention to backward students. Special programmes were held in many PU colleges so as to help students. The district missed out first position with a narrow margin, he said. He said there has been an overall decrease of 7.5 per cent in the results. Introspection will be done as what were the loopholes in the preparations. The district had secured first place in the State in 2010, 2011 and 2013 with 89.08 p.c, 87.15 p.c an 92.72 p.c. respectively. Namritha G Nayak of Kundapur has emerged as one of the toppers in Science in PU board exams, by scoring 592 out of 600 marks. She is a student of R N Shetty PU College. Namritha has scored cent per cent in Physics, Mathematics, Biology and Sanskrit while she has secured 99 and 93 marks in Chemistry and English respectively. She told the media she has appeared for JEE (mains) held recently and is preparing for JEE (Advanced) right now. Her parents are Ganapathy B Nayak and Gayatri G Nayak, who are based in Goa. Namritha was staying at her grandmother’s house in Chickensal Road here in Kundapur. She said her good result is achieved with the help of training imparted to her at college and coaching class, apart from her hard work. She thanked her grandmother Vishalakshiyamma for her all around support. She felt that self-preparation has much to do in scoring high marks. Namritha plans to be an engineer and has gone in for JEE and CET. s. She said she will chose from Electronics and Communications or Aeronautical Engineering. The plans ahead of all the toppers are hopefully bright.